“Ménage à Troi.” By Fred Bronson and Susan Sackett. Perf. Patrick Stewart, Jonathan Frakes, LeVar Burton, and Michael Dorn. Dir. Robert Legato. Star Trek: The Next Generation. Season 3, episode 24. Syndicated television. 10 June 1990. DVD. Paramount, 2002. And sometimes, Shakespeare and Star Trek just get silly. 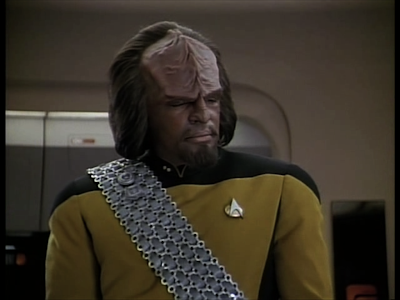 I've written about this episode before, mentioning the slight inaccuracies in the quotations and the unamused look on Worf's face, but I didn't include a clip of all the silliness that surrounds them. We're treated to sections of Sonnets 147 and 141, after which we jump to Sonnet 18. A smattering of Othello rounds out the jealousy Picard is attempting to portray. Then Picard adds a sliver of Alfred, Lord Tennyson—just to round things off.